Single Drum Ride On Roller – Bomag BW 145-40, with an operating weiht of 10,736 pounds, the single drum vibratory roller has a top speed of 5.6 MPH (speed 1) and 6.2 MPH (speed 2). Maximum gradeability of 47%. 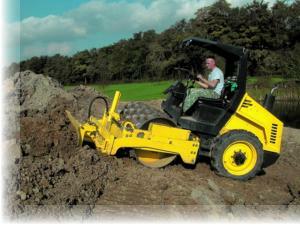 This roller has two vibratory amplitudes enabling optimal compaction results. Its smooth drum is ideal for granular and mixed soils. Notable safety features: SAHR brakes – automatically engaged when engine is off or emergency stop is engaged, rubber mounted operator’s platform – reduces vibration, ergonomic layout of controls for easy operation.